This small stud was established on the island of Unst, in the Shetland Islands in the 1800s. The stud is now based in Dunrossness. My great grandfather had entries in the first stud book of 1891 and Gue ponies have been exported all over the world, including to as far afield as Australia. As a result, many of my ponies can be traced back to the first stud books. My aim, when I started, was to breed ponies which go back to Gue bloodlines. I am achieving this but, in the process, realise that I must like a particular type of pony as all my stock go back to Marshwood bloodlines, all but one to Berry and also many to Kerswell, Mousa, Tawna and Fairy too. The ponies are miniature although this was not always the case. I started breeding chestnuts but have diversified and now have a variety of other colours including bay, bay skewbald and roan. My ponies get lots of attention and are worked with regularly which is evident as they are all friendly and easy to handle. They are wormed frequently and have their hooves trimmed on a regular basis. 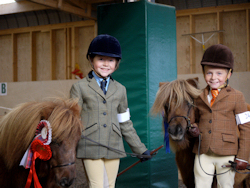 Before acquiring my own stallions I was fortunate to be able to use stallions from some of the best Shetland Pony Studs in Shetland and for this I am very grateful.